The museum opened in 1979 with an exhibition of great andriot sculptor Michalis Tobros. The exhibits were later enriched with a part of the collection owned by Vasilis and Eliza Goulandris Foundation, which consists of more than 300 works of distinguished greek and foreign artists. This first section is now the Old Wing with exhibits of Tobros, Zogolopoulos, Chryssa, Nikolaidis, Takis, etc. Between 1983-1985 there are painting exhibitions of greek painters of the 19th century and later. The big success makes evident that the space is not enough. So, in July 1986, opposite to the existing building, the new four-level wing, studied by architect X. Kontovounisios, is opened. The architectural incorporation of the building to the surrounding area is rewarded at an international contest. The new wing of the Museum of Contemporary Art includes a library, shop, projection room and has adequate facilities for exhibitions of international standards. 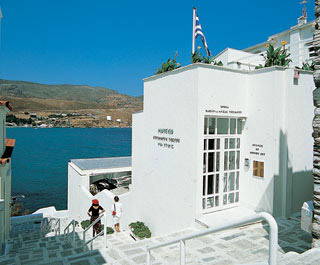 What established the museum and Andros in Greece and abroad, are the art exhibitions of very important artists of the 20th century, organized every summer from 1986 till to date. Works of artists like Paniaras, Picasso, Matisse, Karagatsi, Kadinsky, Bouzianis, Balthus, Galanis, Giacometti, Κlee, Chagall, De Chirico, Rodin, Joan Miró, Georges Braque have been hosted by the museum, as well as an exhibition of the British art of the sixties. Book your accommodation at Onar now and plan your trip to Andros island today!